Dr Perricone has really been pumping out new glorious products this year. 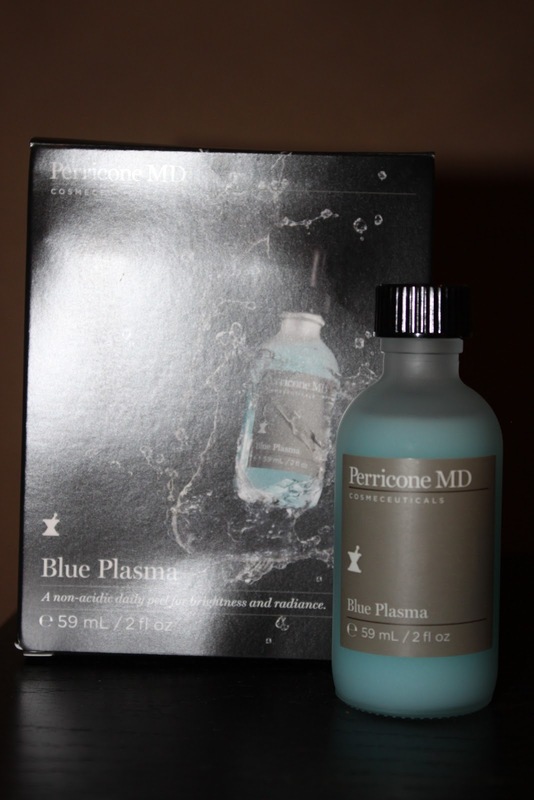 I have had the privileged to have been using Perricone MD Blue Plasma for about 3 months now. It is marketed as a non- acidic exfoliator which harnesses the power of Salmon Roe Enzyme which targets only dead skin cells *weird science*. The curiously blue liquid (all natural by the way) also has L- Carnitine and Copper (hello blue)which work to unclog, repair and hydrate. I use Blue Plasma in the morning after cleansing and/or after toning. It is a dropper bottle, so I dispense a few drops in my palm and smooth it over my entire face. I have not experienced any irritation (though Dr Perricone always recommends spot testing first) or redness since using this product. There is no discernible scent either. I have found that my skin’s texture is looking fine and fresh. My skin really has regained a more youthful glow and looks energized as my dead skin has been gently sloughed off. I think if you are concerned about lack-luster looking skin, this product could work for you. Also, aging skin needs a little help as cell turnover decelerates with time. Many chemical exfoliators can leave skin dehydrated, however the moisture in my skin has not been compromised and appears to be less dehydrated than before (a problem for me). I have only made a small dent in the use of this product and have only used just over a quarter. This is a really good non-irritating daily exfoliator. This adds more depth to the already extensive Perricone range, as they do not have a mechanical exfoliator (a scrub) or a chemical one, both which can cause some irritation. Dr Perricone believes inflammation is a major player in aging, so this products aims to keep irritation and redness out of the picture. Perricone typically used Glycolic Acid as their gentle daily exfoliator in their Toners like Serum Prep, Cleansing Bar. This technology takes exfoliating to another level. I received this product for review before I started writing this blog. I will definitely repurchase when I finish this product as I feel my skin has benefited from Blue Plasma. What are your thoughts on exfoliators?